Looking for softness and cushioning in a no-show ankle sock? We've got what you want. 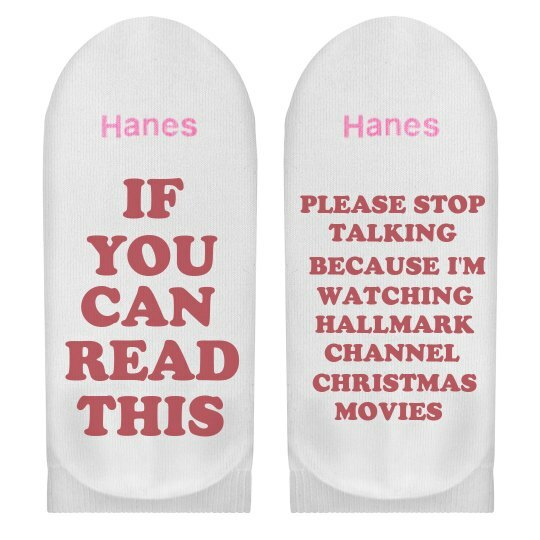 These Hanes ankle socks are great for any occasion, whether you are attending a sporting event, playing in a big game, or relaxing around the house. Pick or create your favorite design in this comfortable Hanes no-show sock. Breathable cotton blended with spandex for a better fit. Wicks away moisture to keep you cool and dry. Extra-durable, long-lasting heel and toe areas. If you can read this, please stop bothering me. No talking. No whining. Just leave me alone. I am watching my Hallmark Channel Christmas Movies. My feet are up. You can see the socks. They have a message on the bottom. One message on the left. One on the right. It's a sign. Please just let me watch this one movie.